Successfully Added Ultra Compact MiniDV Camcorder (Audio Detection, 30 FPS) to your Shopping Cart. The DV25 sets a new record for high quality ultra compact camcorders. This is because within its attractive enclosure is a powerful 2 megapixel CMOS sensor that records video at an impressive 30FPS and 640x480 resolution. This translates into stunningly beautiful video previously unimaginable with camcorders this small. How small do you ask? So small that you can easily conceal it within the palm of your hand, so small that you can put it on a key-chain and hardly even notice its there. With the DV25 you can take high resolution digital videos everywhere you go and never have to worry about carrying around heavy camera equipment again. Sports Action Camera - Attach it to your bike, snowboard, RC car, helmet, or any other location you want to capture extreme sports. Fully adjustable mounting options allow you to capture the perfect angle every time. 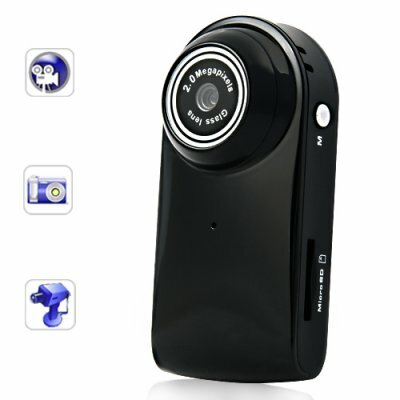 Camera - With its sound detection ability you can set it up to record only when sound is detected. This is the perfect way to catch a burglar in the act or see if your wife is cheating on you when you are away from home. Insurance Protection - Can be used to document evidence of property damage or personal injury for use in insurance claims. Life Blogging - Document your daily activities on your next road trip, camping adventure, vacation, sports event or any other exciting moment you world like to share with the world. Then easily load the user friendly AVI files to YouTube.com and become an instant celebrity overnight! With all the uses this convenient camcorder has to offer there is no excuse to not have one with you at all times. From the high resolution 2 mega pixel sensor and sound detection photo and video function to its ultra compact design and attractive styling, the DV25 is sure to become one of the top selling items in 2010. Place your single piece or bulk orders now while this amazing product is in stock and ready for immediate shipping. Can be attached by clip to your clothes, backpack, bag, etc. If the OFF button is switched while recording, the video will not be saved. Make sure to press the STOP button to save the recording. Automatically saves video after 30 minutes then continues recording. Recording can be sound or manually activated. Does this digital camcorder record audio? Yes, it records video with audio. Can I zoom with this DV camera? NO, there is no zoom function with this model. Can I use this in my bedroom to record some extreme indoor sports? Yes you may. You will need to leave the lights in the bedroom since this camera does not have a IR function. How do I set the correct time and date?